Liquid Filters,Dust Collector,Industrial Liquid Filters,Dust Collector Bags,India. 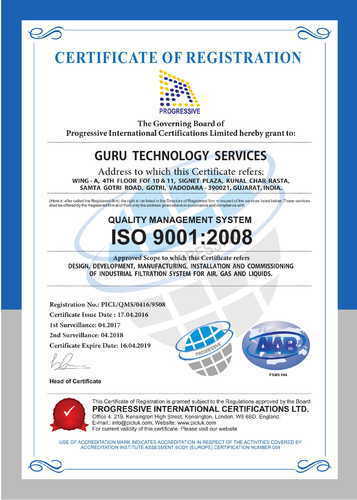 Established in the year 2002, we, Guru Technology Services, are engaged in Manufacturer, Exporter, Trader and Importer and the best quality of Industrial Filtration Products. We offer a wide range of products such as Filter Cartridges, Filter Housings, Compressed Air System, Industrial Dust Collector and many more. Their easy operation, optimum functionality, compact design and longer serving and easy installation, make these filtration systems highly demanded. Textiles, oil refinery, pharmaceuticals, petrochemicals and food processing industries, are some of the sectors where the offered industrial products are highly demanded. Over the years, we have been able to make a wide base of clients by offering them with a qualitative range of filtration and other products and services. We are working with various well reputed companies belonging to different industries like Automobile Inks and Paints, Dyes and Chemicals, Powder Coating, Textiles Oil Refinery, Pharmaceuticals, Petrochemicals and others. Backed and supported by a state-of-the-art infrastructure, we have been able to meet the precise needs and requirements of our customers. Appreciated and valued for its large production, our infrastructural facility is well-equipped with latest machinery and equipment. Our experience in manufacture of so many varieties of filters over last 15 years enables us to understand the application and provide the right solution. We have been able to supply indigenous filters for most foreign makes thus saving considerable monies for our customers. The assistance and support of our professionals has helped us in a commendable position in this domain. Boasting by the skills, experience and knowledge of our professionals, we have been able to meet the precise needs of our customers. By providing our professionals with regular training sessions, we enhance their skills in the most efficient manner. Besides our professionals hold expertise in their area of work. We follow customer-centric approach while interacting with our customers, to attain maximum customer satisfaction and approval. In a zest to attain maximum customer approval, we assure that the offered industrial filtration products is delivered within the assured time frame at the customers’ end.